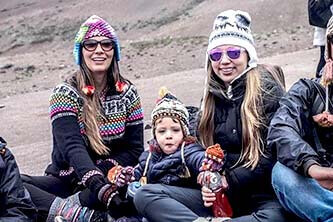 Visit the Vinicunca, popularly known as the Mountain of the 7 Colors. This natural tourist attraction is one of the new and most popular attractions in Peru. The Service All Included Service offers a safe trip with all the benefits of a quality tour. Tourist guide service in English or Spanish. Pick-up service from the door of your hotel. Transportation during the whole service. WHAT IS THE SERVICE ALL INCLUDED? The Service All Included is one of the most complete and safest tours in the Mountain of 7 Colors. Includes transportation, entrance fee, tour guide service, typical breakfast and lunch and more. The Service All Included - Full Day to the 7 color Mountain requires a detailed organization. The tour includes everything necessary so that the visitor does not suffer the consequences of extreme weather in the Vinicunca: transport by bus, breakfast and typical lunch, tour guide service and much more. The tour begins with the tourist pick-up from the door of your hotel in Cusco. Transportation is in a large and comfortable minivan. Transportation is permanent throughout the tour. It takes us to the closest point to Vinicunca and returns us to the city of Cusco. On the way out we will taste a buffet breakfast in the town of Cusipata. After visiting the Vinicunca, we will return to this town to enjoy a buffet lunch. The entrances to the mountain 7 Colors are in the middle of the walk to Vinicunca. These tickets are included in the Service All Included. 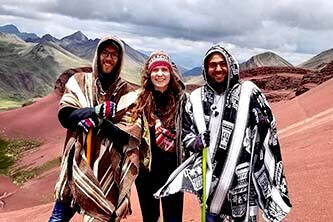 The official tour guide has years of experience doing tours in the Vinicunca. He is qualified to offer tours in English or Spanish. 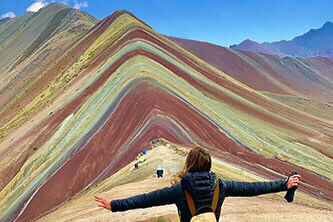 The Mountain of the 7 Colors is also known as Vinicunca. It is located at 5,200 meters above sea level. To get there you must walk (or ride a horse) for 5 kilometers of up and down hills and mountains. Today, it is one of the most famous tourist attractions in Peru. The Service All Included to the Mountain of the 7 Colors offers a variety of benefits such as personalized assistance throughout the service, option to cancel tours, easy payment by credit or debit card and all with the security provided by a tourism agency with years of experience in the sector. The Service All Included is designed by tourism professionals from the Machu Picchu Terra agency (with authorization number AUT00115. The tour to the Mountain of the 7 Colors provides a permanent communication before and during the tour. You can contact by phone at 084 - 403077. With the Service All Included you can cancel a tour already paid. You should only do so at least 15 days in advance. The procedure has an economic penalty. Getting the Vinicunca tour is easier than it seems. Just book online the All Inclusive Service and pay by credit or debit card Visa, MasterCard (or PayPal). The tourist can visit with total tranquility the Mountain of the 7 Colors. The tour includes wooden canes, first aid kit and an oxygen container 'oxishot'. At the entrance there will be an ambulance for emergencies. The Service All Included - Full Day Mountain 7 Color offers the best prices on the market. Our rate includes typical breakfast and lunch as well as transportation by car, tourist guide service and tickets to Vinicunca. RESERVE AND SECURE YOUR PLACE! WHAT WILL YOU SEE IN THE VISIT? The Mountain of the 7 Colors stands out for its incredible landscape beauty. During the whole tour, the tourist will appreciate the beautiful landscapes of this high Andean area. You can also see llamas, alpacas or vicuñas along the way. 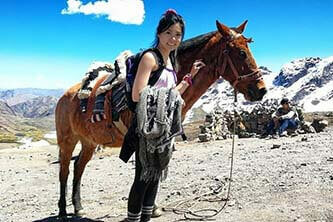 The trekking route or the horse riding are also a memorable experience. 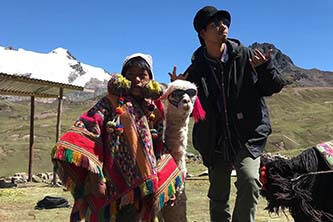 During the tour by car and on foot, the tourist will be able to appreciate the different types of Andean camelids in their natural habitat: llamas, alpacas and vicuñas. 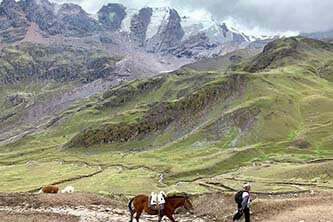 You can choose to walk or on horseback the last 5 kilometers of road to the 7 Colors Mountain. The transfer by horse is requested at the entrance door. The locals are used to tourism. It is a good opportunity to learn more about them. The Vinicunca or Mountain of the 7 Colors is considered one of the 100 places to visit before dying according to the National Geographic magazine . Start the Service All Included - Full Day to the 7 Colors Mountain with pick-up from the door of your hotel. Then we will travel to the town of Cusipata to enjoy a nutritious breakfast. Then we will continue the trip to the closest point to Vinicunca. We will walk (or ride a horse) to the Mountain of the 7 Colors. After enjoying the incredible scenery, we will return to Cusco on foot and bus before enjoying a delicious lunch. We will start the tour picking it up from the door of your hotel. Then we will leave in our transport in south direction until the town of Cusipata. 6.30 a.m. - 7.30 a.m. In Cusipata we will enjoy a delicious breakfast buffet with nutritious ingredients to combat the effects of height in the Mountain of the 7 Colors. 7.30 a.m. - 8.30 a.m.
Then we will return to the checkpoint of Pampachiri where we will get ready for the walk to Vinicunca. From the control point there are 5 kilometers of walk to the Mountain 7 Colors. At the control gate there are locals offering to take them on horseback. The others will go on foot with our guide. 10.30 a.m. - 12 p.m. In the Mountain of the 7 Colors we will have enough time to appreciate the landscape and take the photos we need. Then we will undertake the return journey. The tourists who booked a horse will return with their muleteers. Visitors who return by foot will do so in the company of the tour guide. At the Pampachiri checkpoint our transport will be waiting for us to take us back to the town of Cusipata. In Cusipata we will enjoy a rewarding buffet lunch to recover energy. The lunch is made with natural ingredients that are produced in that region. Finally we will start our return trip to the city of Cusco. The final whereabouts are within walking distance of the Plaza de Armas, close to the hotels and restaurants. HOW TO GET HORSE IN THE MOUNTAIN 7 COLORS? The transfer by horse is not included in the tour. This service is organized by the communities that live around the mountain. That's why the only way to get a horse is by dealing directly with the villagers. 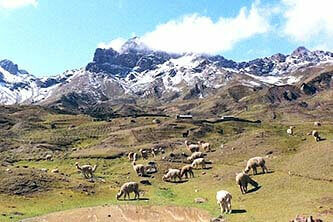 They are accustomed to tourism and will be glad to move them on horseback to the Vinicunca. Horses are used to moving people to the Mountain of 7 Colors. 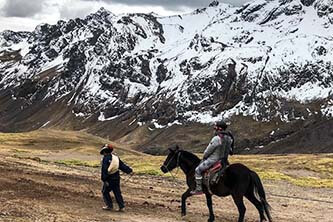 The transfer on horseback is always accompanied by a local muleteer who will guide the animal to the Vinicunca. 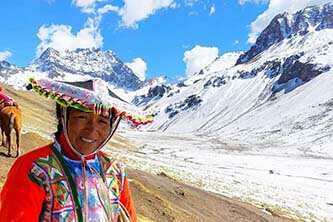 The inhabitants of these high Andean areas are engaged in agriculture and livestock. However, many of them also benefit from tourism. The horseback ride through the stunning landscapes of Vinicunca is an incredible experience. The transfer service on horseback costs approximately $ 28 (round trip). This service is recommended for the elderly, minors and people not accustomed to physical effort . The Mountain of the 7 Colors is a special natural attraction due to its location high in the Andes of Peru. It is recommended to be careful with children. It is also recommended to acclimatize before the tour, prepare physically and get informed about the weather at the time of the visit. The tour is not recommended for children under 8 years old. 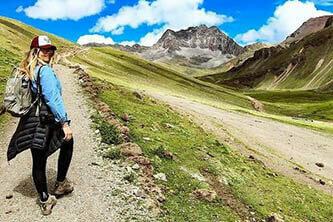 In case of coming with minors, you must choose to arrive at Vinicunca on horseback. It is important to acclimatize to the climate of the city of Cusco at least 1 or 2 days before the tour. 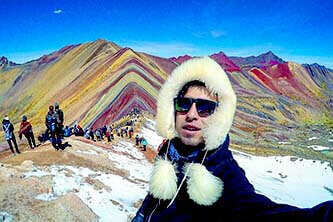 The 7 Colors Mountain is 5,200 meters above sea level. The climate in the mountain changes suddenly. In the months of June, July and August, snow can cover the landscape. It is recommended to inquire about the weather for the day of the visit. 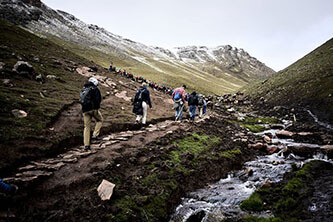 The walk to the Vinicunca has a moderate - high difficulty. It is recommended to do a bit of walking or go for a run a few days or weeks before the tour. These are some of the main questions asked by clients interested in booking the Service All Included - Full Day to the Mountain of 7 Colors. If you have any questions, you can write us at info@boletomachupicchu.com or call us at 084 - 403077. 1) How many tourists are there in the group at most? The Service All Included to the Mountain of the 7 Colors is shared. The groups are of 20 tourists at most. However, usually fewer people travel to the mountain. 4) Is it dangerous to visit the Mountain of the 7 Colors? No. The discomforts of altitude sickness usually happen with the passing of time. The Service All Included offers a first aid kit. In addition, the tour guide is trained for emergency situations. 2) Are there toilets on the way to the mountain? Yes. The locals have installed bathrooms during the trip to the mountain. These services have a cost of 1 Peruvian sol (0.3 USD). 5) What to take to the tour? It is recommended to wear a windbreaker jacket (there is always wind in the mountains), comfortable hiking pants, rain poncho, sun block, hat, trekking shoes, water and extra cash to do some last minute shopping (at the door) of income there are stores). 3) Can I get a horse on my own in the place? Yes. Many residents offer their horses at the checkpoint before starting the walk on the Mountain of 7 Colors. However, in high tourist season (from April to October), all horses can be reserved. DO NOT STAY WITHOUT KNOWING THE 7 COLOR MOUNTAIN - BOOK NOW!